It is claimed by remuneration committees and pay consultants that executive pay has to keep up with international (i.e. US) levels to prevent our best bosses being poached overseas. "..in the last five years only one FTSE100 company has had its CEO poached by a rival, and that rival was also British.... The chance of having your CEO poached by a competitor in any one year would be 0.2%." 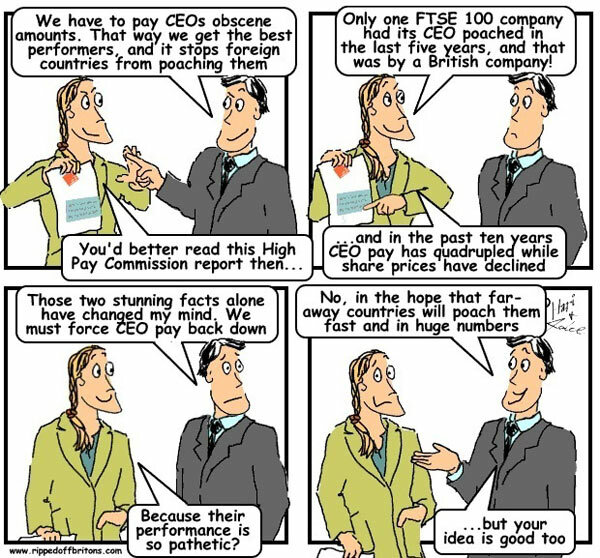 "Total earnings for directors of FTSE 100 companies increased by 49% last year, far outpacing pay claims for workers outside the boardroom. A FTSE 100 executive typically received an average of £2.7m in 2010, according to the research by Incomes Data Services, which analysed payouts of salaries, bonuses and long-term incentive plans the last financial year. For chief executives, the average total pay deal was £3.8m – an average rise of 43.5% – while IDS calculated that finance directors received an average increase of 34.1%,to take their average to £2m, while all other directors received an average increase of 66.5%, to take their average to £2.2m." "Using a measure of "remuneration awarded" – salary, any cash, benefits and the expected value of deferred bonuses and share options – the survey found that the median increase in chief executive pay in FTSE 100 companies was 10% but in more than 25 of these companies the rise was greater than 41%. Employees at FTSE 100 companies got mean average rises of 1%." Shareholders should adopt an absolute measure of value rather than a comparative one. For example, if it is reasonable for leadership, management and supervision to cost no more than half the total workforce cost, managers should get no more than half the total remuneration of all their direct reports, and this applies at every level of the organisation. Just 6.5% (32) of current CEOs were poached from another company while serving as a CEO."